Lindeman Lake is one of my most favorite hikes. This is short hike but it is quite a bit of cardio so don't fool your self into thinking it is easy. I love this hike because it has lots of logs & bridges to cross. At the top is the lake and camping pad. The one thing I can find wrong about this hike, is the drive. Just a note of caution...I have had a cougar follow me on this hike. 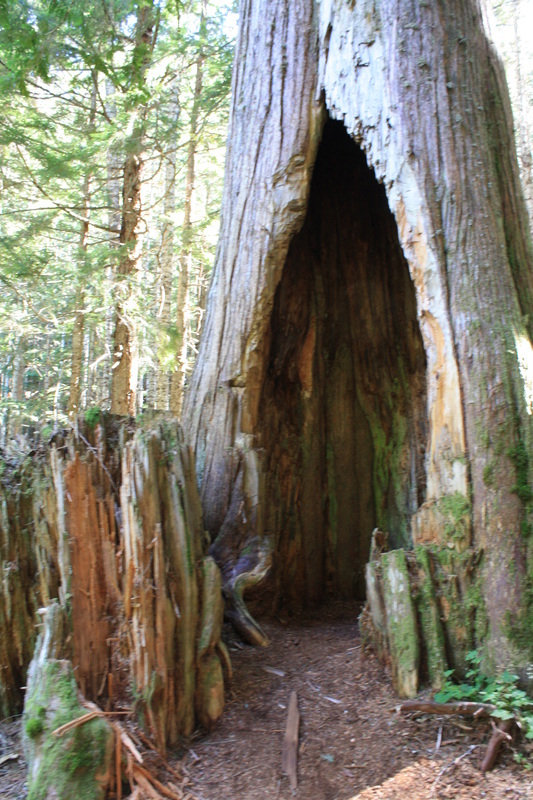 I say its kid friendly but maybe not the best hike for small dogs or children! If you do decide to bring your children I would keep them close to you and dogs leashed! Happy & safe trails! 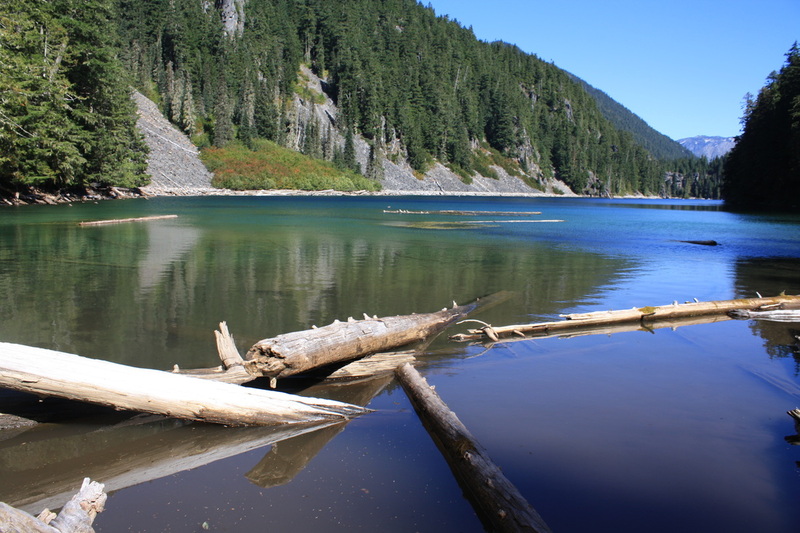 Once at Lindeman Lake carry along the dirt and rocky path along the lake. There are the occasional big rocks to climb over. Soon you come to your first boulder field. It's a tricky one. Take your time and plan your route keeping the path ahead of you in line. There are some loose rocks here so watch your footing. If you can cross this one you will be fine the rest of the way. Once across, there's a broken bridge and a flight of stairs to go down. You'll cross three log bridges along a rocky path with boulders on your left side. Soon you come to your next boulder crossing. Then you'll walk in the forest... It's rooty and rocky. Then the next boulder field is quite short with another forest path. This is where it opens up and a big boulder field awaits you. It's a little tricky but take your time as you are far into your hike and still have a ways to go and don't want any injuries. Soon you're back in the forest for a short path. 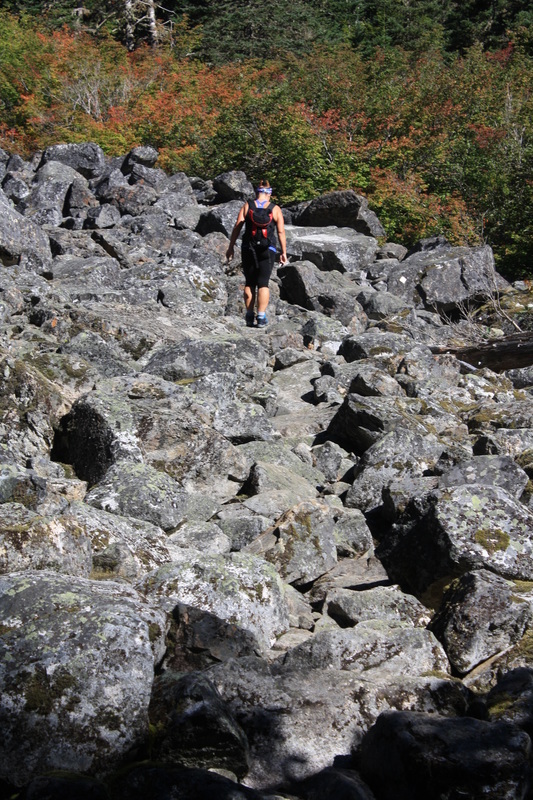 Then a long rocky path with boulders all around you. Again watch your footing as the rocks are small and medium and loose. Then another rocky and rooty path and a short boulder field. The next boulder field is a little tricky but doable. Just take your time. Now you’re going to go down over roots, rocks and a few logs. When you come to the bottom of this part you'll see your first sign. Right takes you to Greendrop and left goes to The Trans Canada Trail over a log bridge. It's flat here with streams and a lovely calming forest. Finally you'll come to a log bridge with half a broken railing. It's wide and fine to cross. If you’re nervous poles will help with balance. There's just a little bit more roots and rocks and soon you'll see Greendrop Lake. Not really worth all the boulder crossings to see it. We headed back to the streams for a foot soak and our lunch. Once finished head back the way you came. Happy & safe trails! One of the many boulder crossings.